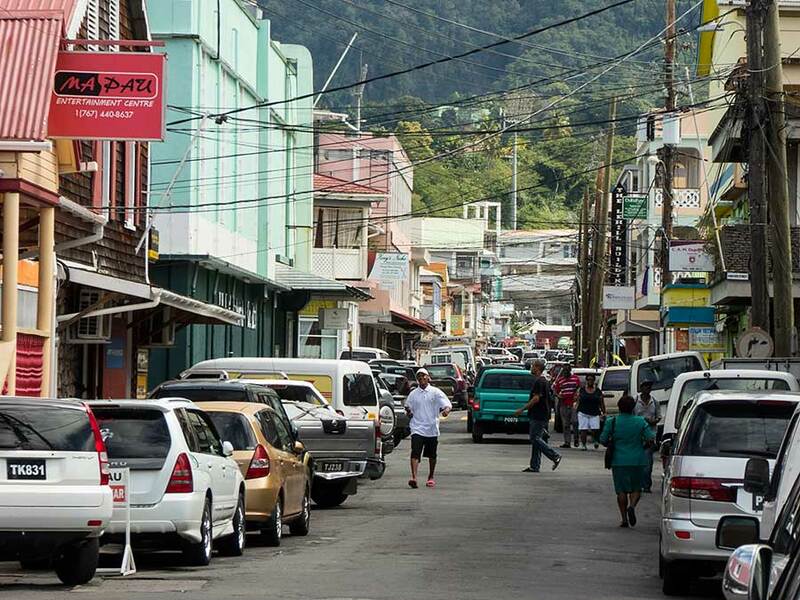 Correction from last blog: The population of St Vincent is about 106,000. We decided to skip St Lucia and Martinique and head for Dominica. Leaving Blue Lagoon we sailed up the windward coast of St Vincent to avoid forecast calm areas to leeward. It took us all day, not doing very well on port tack because of the swell, but by dusk we were passing through the channel between St Vincent and St Lucia. Apart from a shortish calm spell we made good progress through the night, keeping St Lucia and then Martinique about 20 miles to windward - sailors say pass by within 2 pistol shots (about 50m) or at least 7 leagues (about 20 miles) offshore when sailing past a mountainous island. Before dawn the wind dropped for a longer spell so we motored a few hours and then it was plain sailing to the anchorage just south of Roseau on the southwest of Dominica. We arrived mid afternoon and were greeted by "Beans", a boatman who works for "Sea Cat", quickly accepting his offer of a mooring, knowing that the anchoring options here are limited because the coast shelves steeply. After a swim to cool down and check the mooring, visible in 7 metres, we were looking forward to a day's rest. Then a little later Sea Cat (whose real name is Octavius) came to tell us that 3 crew on a nearby yacht wanted to tour the island the next day, and suggested we join them. The nearby yacht turned out to be a Rival 41 called Scipio of Parkstone, crewed by owner Gerry and 2 friends. We started the day with a visit to Customs where after filling in a couple of forms we were given clearance to stay up to 2 weeks and then leave, meaning no need for a further visit - Dominica welcomes visitors! 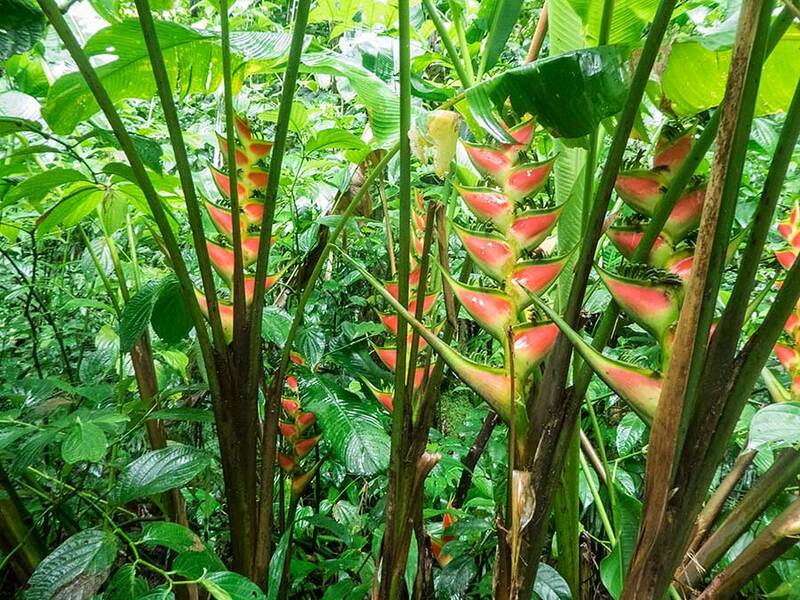 Our driver "Chef Gordon" then took us across the island, stopping at many places to tell us about the flora and fauna, especially all things edible. We tasted fruit fresh from the tree like tamarind (a sharp flavour so not so good to eat alone) and custard apple, and were challenged to identify various spices, which he collected from the roadside. 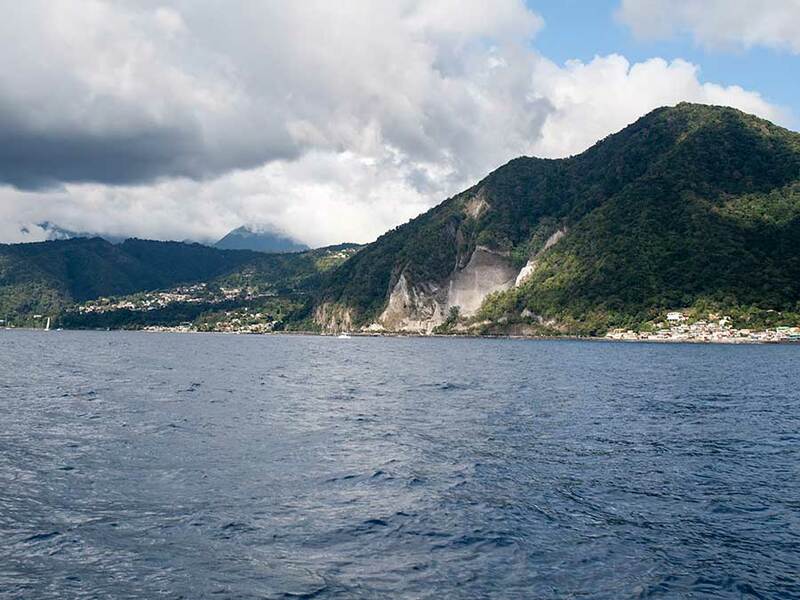 Dominica - with a population of about 70,000 - is even more rugged and breathtakingly gorgeous than St Vincent. It has seven active volcanoes, many waterfalls and rivers, several lakes (one boiling) and very diverse rainforest, with tropical montane and elfin forest regions at higher altitudes. At one time there were large plantations growing citrus fruit, including those owned by Lauchlan Rose, inventor of the famous lime cordial. Grapefruit were grown for the export market; a labour-intensive process that involves careful plucking from the tree when still unripe, all the fruit having to be caught in hand (hence cricketing prowess?) then transporting them over winding tracks and narrow roads to the docks for shipping. Production has declined and the big plantations have mostly returned to rainforest but the grapefruit still produced and sold locally are allowed to fully ripen. The flavour is completely different - sweet and hardly acidic at all. 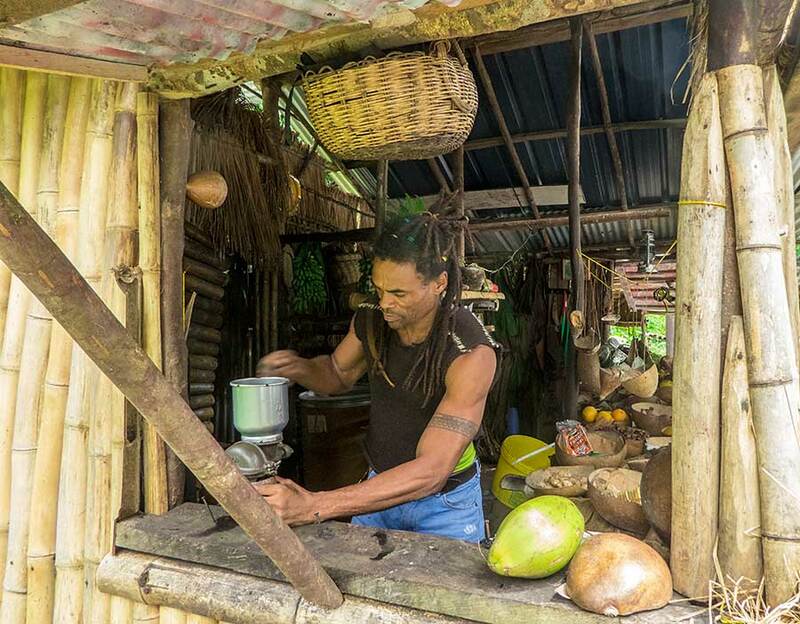 On the way to the east coast we stopped off at the roadside establishment of Ronald, who grows his own fruit, vegetables and herbs, roasts his own coffee and chocolate, makes delicious coconut sweets and much more. Everything he sells is prettily arranged in calabash bowls. He seemed to be doing a good trade from the cruise ship passengers who disembark for a few hours and overwhelm the main, easy to access attractions on the island. Once we got to the east coast it was not far north to Kalinago Territory. This is where a community of Carib Indians live. They resisted colonial rule and hid away in the remote northeast of the island. In 1903 a reserve was created when there were only about 400 left. Now there are 3000 and they are much more integrated into Dominican society but still retain their own identity. Gordon took us to the house of an elderly couple to show us their smokehouse and garden. Traditionally meat, such as agouti, was smoked before the (only recent) introduction of electricity and refrigeration. 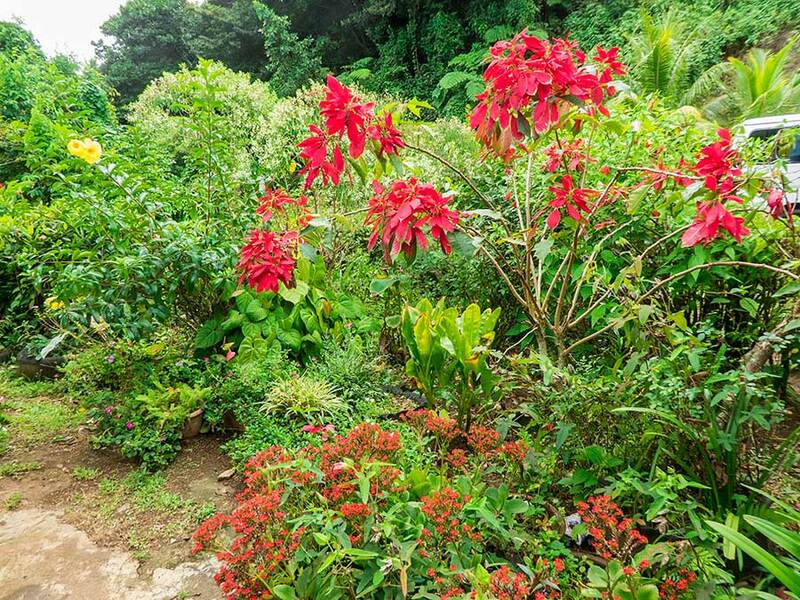 Although poor by our standards, their garden is full of fruiting trees and exotic plants and flowers - some of which are grown for medicinal purposes. 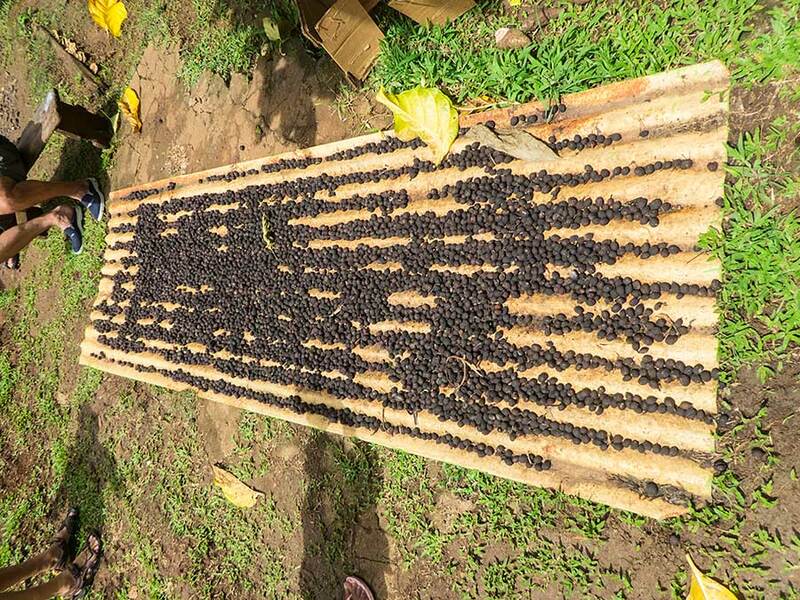 Coffee beans drying in the back garden . 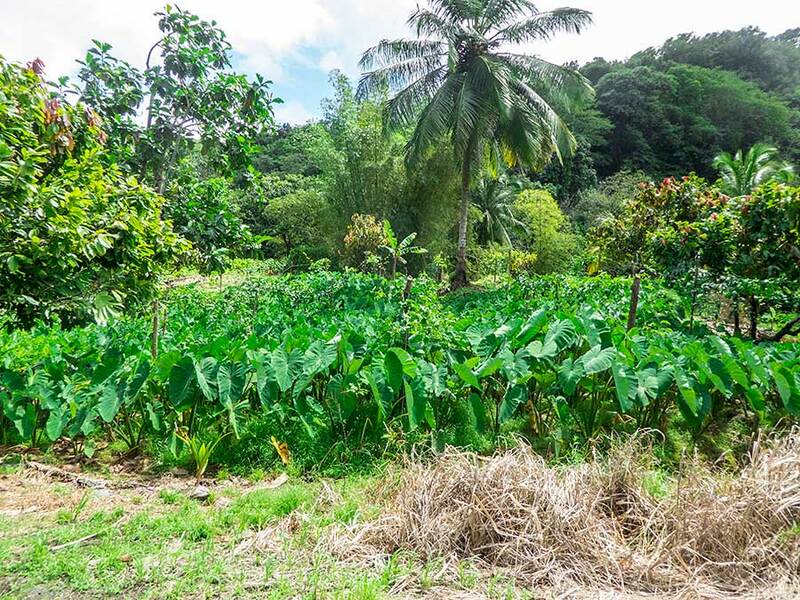 . .
Dasheen (taro), now a staple crop in the West Indies, grows everywhere like a weed. The fresh leaves are used, with spinach, to make a soup called Callaloo. (We first met this in Trinidad where soups made of many ingredients, including cow heel, are popular.) Cassava is another staple and the Kalinagos make a thick, flat bread from it, including other ingredients such as coconut. Fresh from the oven it's quite nice but when cold it's very heavy on the stomach. 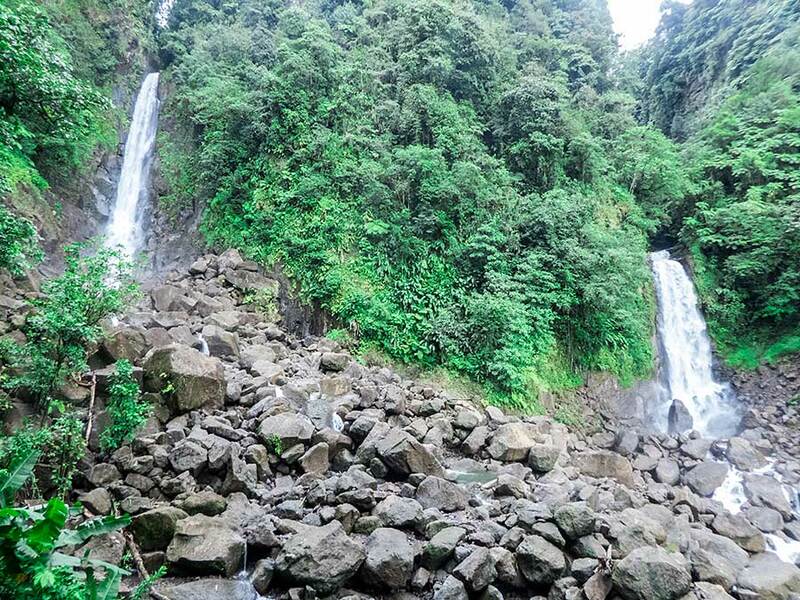 On the way back we stopped to see the Trafalgar Falls - a typical tropical rainforest attraction, within easy reach of the cruise ship minibuses - and then back at the outskirts of Roseau we detoured through the Botanical Gardens to see the Sisserou parrot in captivity. 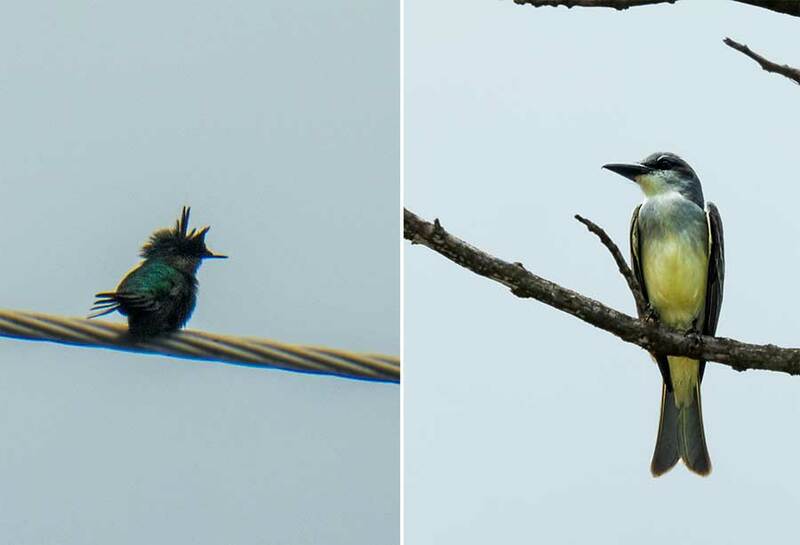 Sadly the national bird of Dominica hasn't been seen in the wild since hurricane David in 1979. Both hurricane David and last year's tropical storm Erika come up frequently in conversations about the economy and environment of Dominica. David devastated the island's economy and changed much of the landscape. 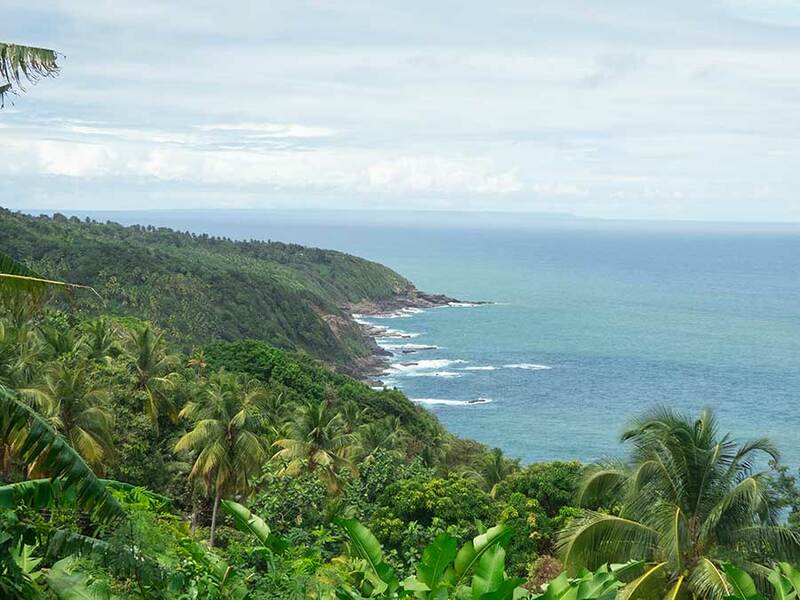 The problem with Erika was not so much the winds but the torrential rain - 12 inches in six hours - which caused landslips everywhere, including devasting a village and killing 30 people. More to come from the Trois Pitons national park after a day's rest.